A stepmother and daughter move next door to a sinister Reverend. Moving into a new home is hard. Combine that with trying to make a relationship work between natural enemies such as stepmother and daughter and you have a recipe for stress. That’s the underlying premise for this movie. New stepmother Denise (Chanel Ryan) and Shani (Megan Jay) up stakes to make a go of it in rural Redwood California, making house until they can be joined by the person they have in common – Shani’s father Bill (Mitch Costanza), who is deployed in the Middle East and will join them once his tour is up. Almost as soon as the duo arrive at their sprawling new home they are approached by their neighbour, Reverend James (Jaye Wolfe), who is just that tiny bit too friendly as he ingratiates himself into their lives but clearly has underhanded designs on them. Also thrown into this mix is Denise’s father Bob (Brian Spencer), who is just down the road from them and had helped them secure the abode, and Reverend James’ sidekick Raul (Adrian Torres), who is all smarmy comments and nasty intentions. The house soon reveals itself to be full of secrets and danger, the biggest being the lengths that Reverend James will go to in order to get his hands on it, hoping to drive out the new owners with escalating scare tactics. What he didn’t count on was Shani’s trophy-winning ways with a handgun. First time director William Scherer was obviously hoping for a slow burn thriller here. The effective musical score tells of his desire for a mounting pressure thrill-ride heading to a tense stand off, but unfortunately it's all a bit of a damp squib. Looking at his many, many roles on the production, perhaps Mr Scherer bit off more than he could chew, as he does everything from effects to writing to acting to sound. This leads to the sound quality being distracting and changeable, with some scenes going from a strange hissing sound to a muffled sound; and community theatre effects and gunshots that sound less impactful than a balloon bursting. There is a reason people devote their lives to studying and perfecting these vocations. I’m all for a ‘muck in’ spirit, but some things are best left to those in the know. The acting leaves a lot to be desired with Jay yelling or sulking through every line, though it must be said that her character is a thankless and irritating one, particularly in the beginning. Spencer is wooden and stagey, Wolfe chews scenery like he's Nicolas Cage and does everything except twirl a moustache in his wickedness. Ryan however comes across as natural and warm, and does her best with some of the less-than-believable scenes she has to enact. The script is muddy, darting between too much information and leaving out details; and some of the dialogue is unintentionally hilarious. Funniest line? "It's a losers house Denise. Read my lips. It's a house for losers," said directly after a power cut plunges them into darkness - nobody can even see your lips Shani! Let alone read them! Or what about this gem from Grandpa Bob while getting to know about Shani’s gun toting skills - "Did you ever think about participating in the Olympics sometime?" Like it's just something she might look into one day for shits and giggles. This is followed by wholly inappropriate joking about biting heads off chickens, as though that's just a little bit of harmless tomfoolery instead of sick cruelty - quite distancing for the viewer. Questions abound - do Reverends really go jogging in cross adorned caps? And do pizza places really deliver food out in the woods? It must also be said that in all my years of movie watching I’ve never seen such an over reaction to a snake; and then the ridiculously small, obviously fake, plastic snake the priest accuses Denise of mistaking it for is beyond foolish. Try harder Rev! The ending stretches out beyond the point of interest, though one 'bullet' shot is beautifully filmed. The last scene of the ladies smiling - like they just watched a good movie instead of dealing with a possibly dying family member - is preposterous, and unfortunately, with the quality of this movie, not a smile the audience will be sharing. 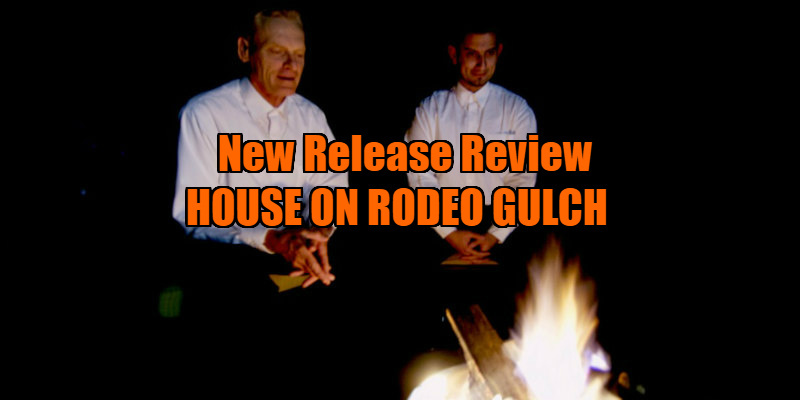 House on Rodeo Gulch is on VOD now.